Travel, Theme Parks, Nature and Food! Chocolicious Fun at Universal Studios Singapore! Chocoholics are in for a treat at Universal Studios Singapore’s latest Chocolate Garden attraction! Go on a Chocolate Adventure from now until 28th May 2017 and indulge your sweet tooth in some of the available offerings. The entrance to the Chocolate Garden can be found between the Sesame Street Spaghetti Space Chase ride and The Brown Derby. This walk-in attraction contains several themed areas like Lollipop Land, the Fondue Garden and there’s also a Choco Hedge Maze! The swirls of colours immediately catch your eye when you enter the garden. It makes for a nice photo spot. There is an area for kids to decorate their own lollipops and they can add them to the Lollipop Garden! Get lost in this maze and who knows, you may even find some chocolate treats hidden amongst the bushes! It’s a pity the hedges aren’t high enough for adults to get lost in, but kids would probably enjoy this! For a limited time, marshmallows are given out for free near the entrance to the Chocolate Garden, but if you haven’t had enough of them, you can purchase more at $1 for a set of 2 packets, each containing 2 marshmallows. The stickers that you see on the left of the photo below are for those who have registered for the cupcakes and cookies workshops. Now if you have your marshmallows in hand and using the sticks provided, go dip them into the various chocolate fountains for a sweet indulgence. There are several chocolate fountains of different varieties like Milk Chocolate, White Chocolate and there are even Strawberry and Pandan flavours!! There are a few characters that you can meet in this area – Candice Cupcake and Mama Cookie are two newly introduced characters at the park and then there’s everyone’s favourite Cookie Monster from Sesame Street. Candice Cupcake is such a sweetie pie! Mama Cookie is quite a feisty character! The Chocolate Man wears a badge or patch with the words “Are You Looking For Me?” and he will be roaming the park. Look carefully for him as you explore the park and when you do find him, shout “Got you! You are the Choco Man!” and you can win a mystery prize, which ranges from retail and dining vouchers to Universal Studios Singapore admission tickets! If you are feeling creative, you can sign up for one of the sessions where you can decorate delicious cookies and cupcakes. It costs $6 each for a cupcake or a cookie. We were first given a demonstration of how to decorate a cupcake and the kids looked like they couldn’t wait for their turn to try doing it! Here are some samples of cookies and cupcakes that have already been decorated – they all looked like a sugar overload to me! Ok, now’s my turn to have a go at cupcake decorating and we were given some white chocolate, strawberry chocolate, four different bottles of cream and lots of candy sprinkles!! On the left is my chocolate chip cupcake and on the right, my completed masterpiece! You can bring your cupcakes/cookies home after you have finished decorating them, i.e. if you don’t plan to eat them on the spot. A word of advice – if you’re doing cupcakes, do remove the flag before you put the cupcake into the box. I forgot to do so and mine was a little squashed after I put the lid over. I wandered around the park to see if I could interest any of the park’s characters in some chocolate. The Minions weren’t interested – oh yeah, I forgot that my cupcake wasn’t banana flavoured (you can see my squashed cupcake here). Do go check out the Chocolate Garden and the various characters there. It’s also a good place to hang out to get away from the scorching sun! Chocolate-flavoured delights can be found at various dining outlets in the park and these include Cho-infused Curry with Chicken Katsu, Nutella & Cheese Fries, Crispy Chicken Strips with Chocolate Dip and Cocoa Slush. Visitors can purchase the Sweet Tooth Package and choose three selected chocolate-themed items at participating dining outlets for just $20. A Chocolate Adventure is a new experience included with regular paid admission to Universal Studios Singapore. Now until 28th May 2017. [Media Preview] Universal Journey – the World’s Largest Indoor Light Display! The Universal Journey is a brand new experiential festive light display, which is the highlight of this year’s Santa’s All-Star Christmas at Universal Studios Singapore. It features eight thematic zones of wonder that have been constructed with the use of a total of 824,961 light bulbs! Yes, you read the number correctly – this whopping number of lights have earned the theme park a Guinness World Record for having the largest light bulb display in an indoor venue! Take a step in and you will find a Big Planet amidst a backdrop of stars in the night sky. There’s a hole in the middle of the planet and it resembles a wormhole or a time warp tunnel! The lights in the tunnel change colours, so you can take your pick of your favourite colours when posing for pictures. You will soon be transported into the Enchanted Pine Forest, where you can find trees in a mesmerizing assortment of colours! Upon closer inspection, you can see that the lights come from these tiny LED light bulbs. How on earth did the Guinness World Record Officials manage to count the total number of light bulbs?!! I think I would be all googly-eyed and probably lose count after a while! After passing through the forest, you will enter the Haven of Pixies, which is a magical realm and it feels as though you have stepped into fairyland! From here we get a glimpse of the next zone and the combination of all the lights is quite a breathtaking sight to behold! Ohh…what is that long archway which looks a little like a slinky toy? This is called the Rainbow Bridge and its name was inspired by Thor, as divulged by Ms Andrea Teo, Vice President of Entertainment at Resorts World Sentosa. The colours move around, producing different effects and I thought it was quite fun to walk through this! The archway at the other end of the bridge will take you into Herald’s Square. Imagine stepping into a quaint European town without having to buy a plane ticket to get there! Cute deer can be found close to the foliage. Betty Boop certainly enjoyed posing for pictures with them! There is a side door to another room which contains the Land of Great Gifts. I just love Christmas light displays and this entire place and its atmosphere is simply amazing with its dazzling array of lights that I just had to get a photo to remember the experience! Bring family and friends, or you can even have a romantic date here and take lots of pictures! It certainly promises to be a dazzlingly spectacular and memorable experience! We even did a mannequin challenge there – see if you can spot me in Resorts World Sentosa’s video! LOL!! Santa’s All-Star Christmas will be held from 1st December 2016 to 2nd January 2017 at Universal Studios Singapore. Pokémon fans may be thrilled to visit the Pokémon Research Exhibition, which is being held for the first time outside of Japan, from 22 Oct 2016 to 2 Jan 2017 at the S.E.A. Aquarium in Resorts World Sentosa. You can also get to meet Pikachu there! Upon entering, you will be given a briefing by the research assistants in lab coats and basically you have a mission to accomplish at this exhibition and that is to identify the Pokémon hidden in a Poké Ball. You can choose only one Poké Ball out of the three difficulty levels – the red Regular Poké Balls (easy), the blue Great Balls (medium) and the yellow & black Ultra Balls (hard). I don’t have much knowledge about Pokémon apart from watching some episodes from the cartoon series in the past and playing Pokémon Go, so I selected an “easy” ball. There are 7 interactive stations in total, where you can pick up clues to try to identify the mysterious creature contained within your Poké Ball. However, note that you can only pick 4 out of the 7 stations to receive your clues, so do choose wisely as to which ones you think will be able to provide the most details for you to accomplish your task! Place your Poké Ball at the slot on the machine to begin the analysis. Took a short breather for a photo with this giant inflatable Pikachu. When you’ve finally obtained your 4th clue, you will be prompted by the machine to make your final deductions and head over to the “Goal” for the answers. I decided to go check out the Pokédex wall to see if I could find more clues to help me identify the Pokémon in my Poké Ball. More than 700 Pokémon are featured on both sides on the wall. Unfortunately, after scanning through all the pictures, I was still clueless!! I could swear that this Totodile was laughing at my incompetence! Ok, I gave up and headed for the last station and to my surprise, the answer was automatically given without me having to key in my guesses! What in the world is this Pokémon? I’ve never ever seen or heard of it! Unfortunately, all Poké Balls cannot be kept as souvenirs and have to be returned just before you exit from the exhibition, so please leave them at the trays. The highlight for me at this exhibition was meeting Pikachu and trying to catch him and bring him home! LOL! Those of you who are interested in visiting this exhibition, do know that an admission ticket to the S.E.A. Aquarium is required and there is an additional admission fee for the Pokemon exhibition on top of the aquarium ticket. S.E.A. Aquarium Annual/Season Pass Holders can enter at no additional cost. Dates:	22 Oct 2016 to 2 Jan 2017. More details on tickets and pricing can be found at the Resorts World Sentosa website. **WARNING** This post contains some visually disturbing and gruesome photos. Please DO NOT continue reading if you are uncomfortable with nightmarish scenes. We bear no responsibility on the repercussions suffered as a result. Halloween Horror Nights (HHN) is back! This will be Universal Studios Singapore’s sixth edition of the event and it promises to be scarier than the previous years! A record number of haunted houses will be showcased and the first-ever theatrical procession, March of the Dead, will make its rounds through the park at scheduled timings during the night. This year’s event runs for 16 nights from 30 September to 31 October 2016 and features five haunted houses, two scare zones and two live shows. If you want a breather between the scares, selected rides like TRANSFORMERS The Ride: The Ultimate 3D Battle, Revenge Of The Mummy, Battlestar Galactica: HUMAN and Battlestar Galactica: CYLON, will be open throughout the night. HHN usually doesn’t start until the Opening Scaremony is held. This starts at 7:30pm during the HHN event nights, so don’t be late if you want to catch it! We are introduced to all the characters who represent their respective haunted houses, with the exception of Jack, the infamous clown who is making a comeback this year with his circus. If you are standing at the front, do note that pyrotechnics and flame throwers are used and you will feel the heat! In case you haven’t noticed by now, Mel’s Drive-In has been changed to Mel’s Die-In!! If you don’t manage to get a spot in front of the crowd, there is a screen located in the middle of Hollywood Boulevard that will give you a glimpse of the action. Customers fall victim to radioactive food poisoning, which transforms them into savage, flesh-eating creatures! Beware, that chicken rice auntie may not be as nice and friendly as you think she is! Claustrophobics, do note that there are many tight corners in this haunted house and you really have nowhere to run hide! I loved that they even have a clothing stall here! 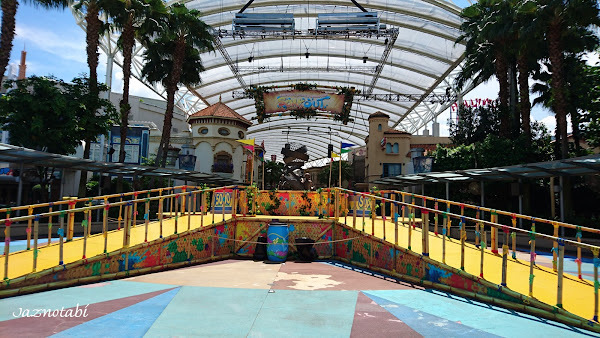 Universal Studios Singapore has really outdone themselves with this one – besides the sights, sounds and frights, one thing that stood out were the SMELLS! Ughh…venture in and find out for yourself! Here you’ll meet the coven of DeFeo Witches who were thought to have disappeared after the townspeople of Salem tried to burn down their house–along with them–in 1692. However, modern-day witchcraft enthusiasts have brought them back and the witches are out for revenge! One of the townsfolk telling us to get away from this place! The most beautiful scene (one of my favourites!) is the Witch’s Realm, which has a snowy setting, much like in Narnia. Apologies, we got too carried away in here as it’s one of the must-visit haunted houses, plus it was quite dark in there and so I don’t have that many photos to share. Make sure that you don’t miss this one!! Some of the scenes from this haunted house can be seen in the first video starting from 0:24. Step back in time into the world of Old Shanghai’s cabaret in the 1930s. As you approach, a man (pimp?) will usher you into the nightclub. Upon stepping in, we see Hu Li singing on stage. Hubby was so enchanted by her that he took another picture! Make sure you stay long enough in this room to see what happens when the light flickers! Look at all the pictures of the beautiful women! Masters of disguises, these seductive temptresses are demonic shape shifters who are after your souls! Overall, I loved the concept of this haunted house and it really made me feel as though I’ve stepped into Old Shanghai! Some of the scenes from this haunted house can be seen in the first video starting from 0:05. Another haunted house based on places in Singapore – the actual hospital in Changi was built in 1935 by the British government and its location was used as a prison camp during the Japanese occupation where it was reportedly used as a torture chamber. The hospital ceased operations in 1997 and is said to be one of the most haunted places in the world! Beware of the many dark corners and you’ll never know who you’ll encounter along the passageways! There’s so much to take in and I’ll let the pictures speak for themselves. There was even a half-naked guy in the bathroom and I thought he looked kind of cute! LOL! Beware – there are many sudden surprises and unexpected encounters in this house! Entrance to the haunted house. Artist Damien Shipman takes fans on a heinous trip down memory lane as he unveils his controversial exhibition titled Bodies of Work. Apparently his family perished tragically in a fire and this is his homage to them. If you look closely, you’ll see a carousel in this photo which is displayed at the start and visitors will also get to see an actual one at the end of this exhibition. Most of the exhibits are displayed in a macabre fashion. Call me a sadist but this girl whose lower body went into the grinder is probably my favourite scene in this haunted house! Loved that there’s a carousel in this haunted house! This is a foreboding forest filled with desperate cries and a sinister presence that lures unsuspecting victims to their deaths. After entering the forest, we came across this vehicle – oh no…what exactly happened here?!! …as well as a “cute” life-size walking rag doll. There is a sinister looking tunnel that you can walk through – thankfully I didn’t encounter any strange beings in there! Ohh…I just love the dramatic lighting effects in this forest! Be careful not to bump into this headless person when you walk through a cloud of smoke! Finally, a short clip to summarize this place. This is the less intimidating of the two scare zones. Stroll through this area to check out the festivities of the Day of the Dead (Día De Los Muertos). There’s also a Death March procession with a supposedly carnival-like atmosphere, but it reminded me more of a funeral procession! Look out for Lady Death (死亡女神), perched atop the leading float. The lights on the float actually change colour. For a change, it was nice to see a night parade being held at the park! There are 2 shows that will be staged as part of HHN6 but unfortunately they weren’t available during the media preview. This action-packed live show begins at the end of March of the Dead procession. All the HHN6 memorabilia seems to be centred around Jack! Many thanks to Resorts World Singapore for the media invite to HHN6! Halloween Horror Nights 6 (HHN6) is held on Select Nights from 30 Sept to 31 Oct 2016. Entry on 30 Sep, 6, 13, 20, 27, 30, 31 Oct 2016. Time: 7:30pm – 12:30am. Entry on 1, 7, 8, 14, 15, 21, 22, 28, 29 Oct 2016. Time: 7:30pm – 1:30am. Check the HHN6 website for more ticketing details, including the Frequent Fear Pass, R.I.P. Tours and other promotional packages. 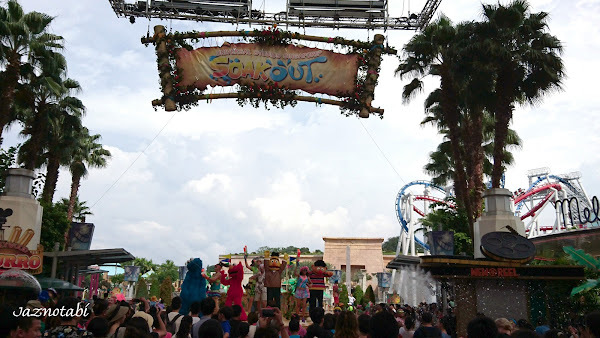 Have some splashing fun at Universal Studios Singapore’s Soak Out Water Party with the Minions, Penguins of Madagascar, Sesame Street friends and the Woodpecker couple – this event runs from 13th June to 10th August 2016. There is also a Soak Out After Party with DJ Inquisitive and the band Good Karma on selected dates (more details can be found at the bottom of this post). The window displays at the Hollywood zone have been changed to fit the tropical beach holiday theme. You can find the Lagoon stage at the end of Hollywood Boulevard, which is the venue for the Soak Out event. 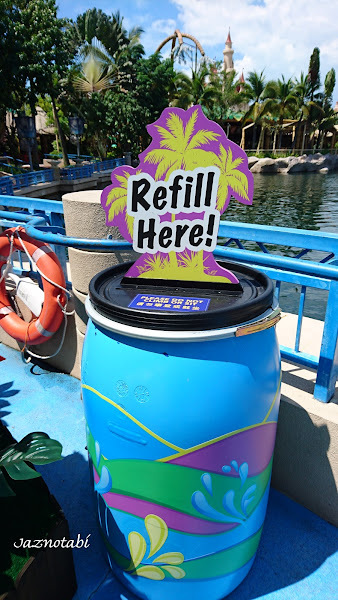 …and these are actually the refilling spots for your water guns! All guests entering Universal Studios Singapore must hold a valid admission ticket. 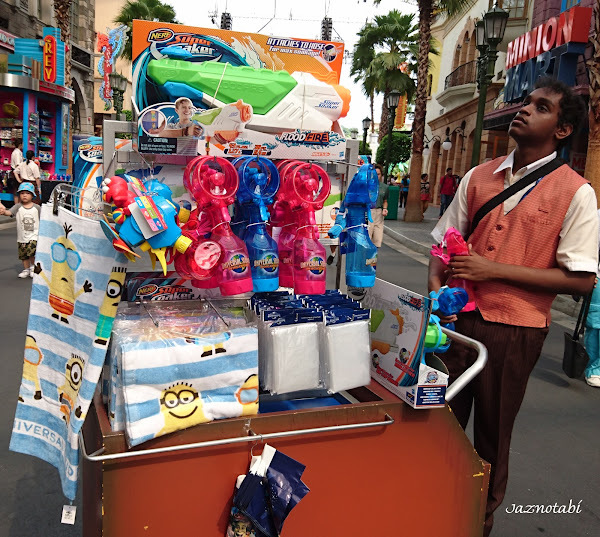 Guests can only use water guns sold at Universal Studios Singapore. 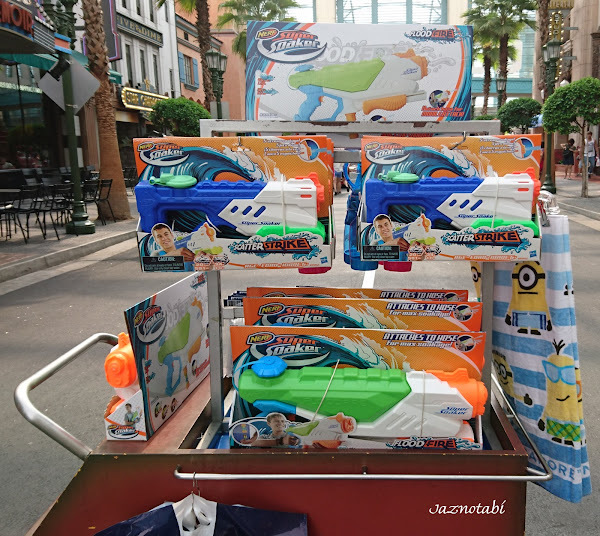 Guests can only use the water guns at the splash zone near the Lagoon Stage in the Hollywood zone. 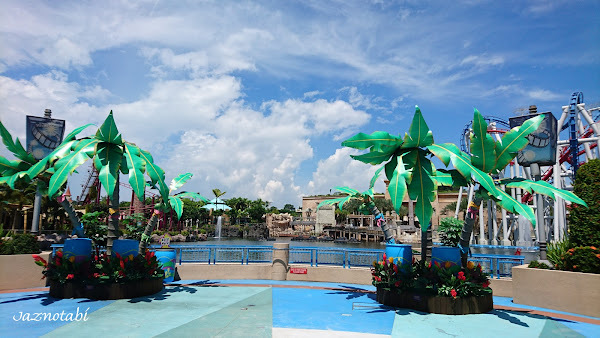 Guests shall not engage in water play at any other zones in Universal Studios Singapore. Guests are not allowed to engage in water play after the Soak Out Water Party and at any other zones in Universal Studios Singapore. Guests must wear proper attire at all times. There are some dry zones at both Hollywood and New York (check with the crew on duty for their exact locations) and I decided to park myself next to this signboard, so that I could duck for cover if a stray stream of water came heading my way! LOL! The Emcee was working out the crowd. Various characters then appeared for the different dance segments. 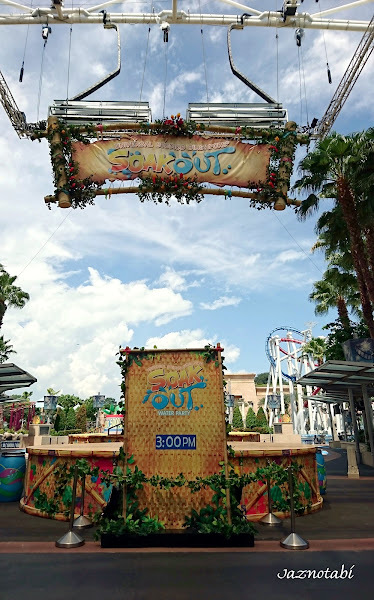 The Soak Out Water Party somehow reminded me of all the previous years’ New Year Eve countdown parties at the park, with character appearances and loud music, except that this is now held during the day and with an additional water component. Personally, it’s not really my cup of tea (sorry!) and I’ve probably long outgrown attending dance parties. In Singapore’s hot and humid weather, it’s a good opportunity for you to get wet and cool off from the heat (i.e. if you don’t mind getting soaked). On another note, I would have preferred if the park had organised a special parade with different floats for the event, similar to what the Disney parks do for their summer events. Dance the night away at the After Party, which begins in the evening in front of the New York Public Library. Its facade will be transformed with eye-popping projection mapping displays and the crowds can enjoy the slammin’ electro beats and Top 40 hits by DJ Inquisitive and the band Good Karma. Universal Studios Singapore celebrates World Monopoly Day by breaking a Guinness World Record! World Monopoly Day falls on 19th March and Universal Studios Singapore celebrated the 81st birthday of the real estate tycoon Mr. Monopoly by attempting to break the Guinness World Records title for the most people playing a Monopoly game in a single venue! The event required participants aged 8 and over to play the board game continuously for 30 minutes from the start of game play without any break. We were up to the challenge and arrived at the theme park early in the morning! Upon heading over to the New York zone, Bumblebee was already there waiting to greet us! How often do you see autobots venturing out of Sci-Fi City into New York?! Both Bumblebee and Optimus Prime tooks turns for an exclusive meet and greet session and there was a brief window when both appeared together before Bumblebee ran off. Even though pre-registration for the Monopoly challenge was already done online, all participants still had to register at the New York zone, where a ticket and wristband were issued for admission into the event venue. This ticket plus a wristband (not pictured here) are required in order to enter the event venue. This was the seating plan for the event. Our wristbands were tagged with the table numbers that we were assigned to, so we had to go locate our corresponding table. It was still about half an hour before the event started and the place was still relatively empty. The version of the board game being played was “Monopoly Empire”, which has a tie-up between Hasbro and Universal Parks & Resorts. Instead of buying title deeds, you buy billboards to fill up your tower. I find this version to be more relevant to today’s context as popular brand names like Levi’s, Xbox, Polaroid, Candy Crush, Caterpillar, Heinz and Transformers are part of the billboard tiles available for purchase. In this version of the game, you don’t need to play for hours and the game can easily end after about 15-20 minutes as the first person who manages to successfully complete filling up his/her tower wins the game! Each participant was given an envelope and a copy of the game instruction manual for reference. The envelope contained 2 Empire Cards, a Brand Token and the pre-requisite amount of Monopoly currency to start the game with. Ok…so my token was a Wilson branded tennis racket. All set to play the game! Our Monopoly Empire board was all prepped up and we couldn’t wait to start! However, I soon found that my opponents all had their eyes on the “Universal” brand and they did a “sneaky swap” on me each time that I got my hands on it!! I was too busy playing the game to take any further pictures and was afraid to walk around in the event that I was disqualified from the challenge. When the challenge was over, participants were treated to a performance by The Rockafellas. Exclusive merchandise was available for purchase and I bought this limited edition Monopoly t-shirt as a keepsake. Ohh… it looked like we may have broken the World Record and Mr. Monopoly arrived for a photo shoot! Yes, we did it!! The previous record of 585 people playing Monopoly was set in the UK in December 2015, but we had 605 participants at the venue today and hence broke the Guinness World Records of having the most people playing a Monopoly game in a single venue! Unfortunately as we had started and ended the game later than the originally scheduled time, quite a number of the participants had already left the game venue to go enjoy the rest of the day at the theme park and thus were not part of the group picture. A certificate was presented by Guinness World Records adjudicator Solvej Malouf to Jason Horkin, Senior Vice President for Attractions at Resorts World Sentosa. I couldn’t let Mr. Monopoly get away without taking a picture with me! Here’s another photo with Jason and the Guinness World Records certificate. A closer look at the certificate. 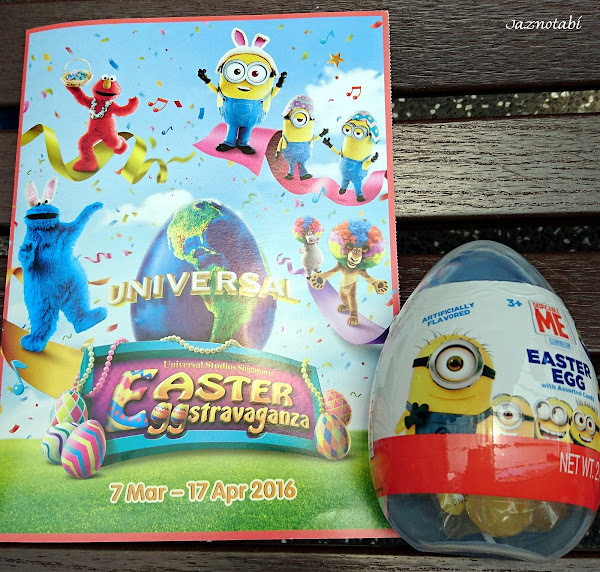 The time of year for Easter egg hunting is here again and this year’s Easter Eggstravaganza event (7 March to 17 April 2016) at Universal Studios Singapore requires an additional fee on top of your day ticket. This would then entitle you to participate in an egg hunt (correct answers will allow you to redeem a Minion egg prize), entry to “An UnEGGspected Wedding” and “Eggingham Gardens”. Annual pass holders can participate in the ticketed Easter events only once during this period – just present your pass at “Guest Services” for your Easter entitlements. The shop windows have changed with the season too. I just had to get a picture with the Minions as there are 3 of them all decked out for Easter this year! The Easter installation found at the end of Hollywood Boulevard changed its appearance several times during my visit! However, if you visit now, the globe has been returned to the top and it’s quite a popular photo spot for this season! Held at the Pantages Hollywood Theater, this stage show revolves around the Egg Lord, who has a deadline to get married before he loses his title and his precious royal purple coat! Arrive early to get a better view of the somewhat cheesey pre-show act. As for The UnEGGspected Wedding, the scenes were bright and colourful, with some funny moments injected into the acts. Whoops! What was the Egg Lord doing with his pants down?!! Don’t worry, there’s nothing to be alarmed about as this is a kid-friendly show. The Egg Lord and his bride – do they make a lovely couple? I must say that the sound at the front row of the theatre isn’t that great, so it’s best to sit a little further back! I think I enjoyed this show more (and better understood the storyline) the second time I watched it. This is a meet and greet session in air-conditioned comfort with the Egg Lord and other characters from show. E.B., Humpty Dumpty and Puss in Boots may appear too! Psychedelic wallpaper at the entrance to the “gardens”. Different characters may appear at the different timeslots, so do pop by here at the scheduled times if you are a fan of character meet and greet! The street has been decorated to fit the seasonal theme! This is a roller-skating performance along the streets of New York and you will find the skaters handing out beaded necklaces to the crowd. If it rains on the day of your visit and the ground is still wet, the performers will appear (minus their skates) for photo-taking and the handing out of the necklaces (i.e. there will not be any performance). Often overlooked are the projection mapping shows on the facade of the New York Library. I must say that the quality and sound for these projection mapping shows have improved greatly as compared to when they first started several years ago! Both the young and old can participate in this egg hunt. Win one of these Minion eggs when you submit your completed card with the correct answers! There are 8 Easter eggs to be found within the park and you’ll need to match them to the locations on the map. Be warned – it may not be as easy as it looks! Some of them were relatively easy to find – i.e. If you are a regular at the park, you’ll be able to easily identify the locations to be searched. However, there was one which almost stumped me and that was the teapot egg! I was using the process of logical elimination and at the same time trying to guess where it could be found! I finally managed to locate it and it was funny cos I had actually walked past its location much earlier without even noticing it!! Wreaths decorated with Easter eggs can be found at both ends of this zone. Hmm…I wonder if this goose is related to the one at Puss In Boots’ Giant Journey? Exotic looking egg decorations can be found in this zone! Found these outside Marty’s Casa Del Wild Food Court, which is the venue for the Easter buffet lunch. If you dine here, there is an exclusive meet and greet with the characters from Madagascar. I happened to bump into these two characters when I walked through the zone, but their costumes are different from the ones at the Easter lunch buffet. Overall it was good fun at the park (especially the egg hunt)! It’s Christmastime again and it’s nice to see the entrance to Universal Studios Singapore with festive decorations again! Even the staff at the entrance are dressed like elves! This year’s theme at the park is Santa’s All-Star Christmas (1 Dec 2015 to 3 Jan 2016) and visitors will be glad to know that all rides and attractions are open till 9pm during this period. Entrance archway to Hollywood Boulevard. Look carefully at the decorations here and you can find Frosty the Snowman, Elves, the Snow Queen, Gingerbread Man, the Little Match Girl, Toy Soldiers, etc… all characters from the new “Fairytale Remix” Christmas show! The exterior of the shops have also been decorated. As you make your way down Hollywood Boulevard, you’ll notice several storybooks along the way, bearing tales which coincide with characters from this year’s Christmas performances. Some of these books are lighted up at night. Over at the Minion Mart, that Giant Minion has been replaced by something smaller! When you turn round the corner towards New York, you will find that the Giant Minion has been relocated next to the Pantages Hollywood Theater. A Christmas tree can be found at the end of Hollywood Boulevard and is a photo spot, as well as the stage for “A Hollywood Christmas Gift Show”. This is a new show which is performed twice daily and it features the Toy Soldiers, joined by the Penguins of Madagascar, Marilyn Monroe and the Minions. Santa’s not there and so the Toy Soldiers are playing Santa instead and various presents are given out to those whose names are found on the “nice” list! In the spirit of gifting, the Toy Soldiers are giving away some park merchandise as part of the show. Just make sure your kids are seated at the front of the stage in order to be the “lucky” recipients. Photo-taking opportunities with the characters are also available after the show, but you’d better be quick to join the queue if you want to take a picture with the Minions as they won’t stay for long and Marilyn Monroe will take over when they leave. Watch Mel’s Dinettes and The Cruisers belt out catchy tunes, dressed in Christmassy colours. The New York zone has also been decorated and I think it looks more magical at night. What do you think? Head over to Sting Alley and walk into a Victorian Christmas scene right out of 19th Century England. Now, if only the weather were as cold to match! At the other end, you can find the Harbour Market. A Scrooge Christmas Splendour is a new performance which is staged here – well, technically there isn’t a fixed stage and the actors are roaming along the entire alleyway. Pick up snippets of information when the characters meet! Park guests can also mingle and interact with Mr. Scrooge and his neighbours and your conversations can be quite amusing! Mr. Scrooge is a rather grumpy soul (watch my video a little further down and you’ll know what I mean). There are different cast members who play the characters on different nights and one of the actors who plays Scrooge is really really tall! I decided to make small talk on my second visit there and was asked if I wanted to buy fish – I replied that I have a preference for chicken, but was told that “fish are like the chicken of the sea”! They were still trying to convince me to buy from them but soon shooed me away after they realised their sales pitch had failed! LOL! Look out for these ladies carrying baskets full of candy as they will hand them out to passers-by. Various shows are being staged at the New York Public Library. Check the park schedule on the day of your visit as the timings may differ. A mash-up of various fairytales told through song and dance and includes familiar characters like Frosty the Snowman, the Snow Queen, Gingerbread Man, The Elves and the Shoemaker and The Little Match Girl. …and we are then introduced to the Elves and the Little Match Girl. Frosty the Snowman and the Gingerbread Man also make their appearance in this show! Photo-taking with the show’s characters is available after the show and there are three separate queues for the various characters. The annual display of colorful lights projected on the New York Public Library that “dance” to groovelicious music. Set to the tunes of familiar Christmas carols, the light show projected on the façade of the New York Public Library tells a tale of a wintry Christmas. The Sesame Street Saves Christmas Show is back again at the Pantages Hollywood Theater. A Christmas tree can be found in front of the entrance to Puss In Boots’ Giant Journey. At various times of the day, you can take pictures with your favourite characters and I stumbled upon Shrek and Princess Fiona in front of their house. The Woodpeckers can be found at Hollywood. Betty Boop makes an appearance here too! Just can’t get enough of them! The Minions are soooo cute!! Meet Santa between 12pm-9pm on the hour, in front of the Christmas tree. Note that snow falls along Hollywood Boulevard and New York every hour between 12pm-9pm. This can be view around the Hollywood Lake (only on 12, 19-29 December 2015 at 9pm) and is a dazzling fireworks display with a festive musical score and pyrotechnics. A trip to USS at this time of year certainly does get you into the festive mood and it’s nice to go and soak in the atmosphere. Overwhelmed by Minions at Universal Studios Singapore! 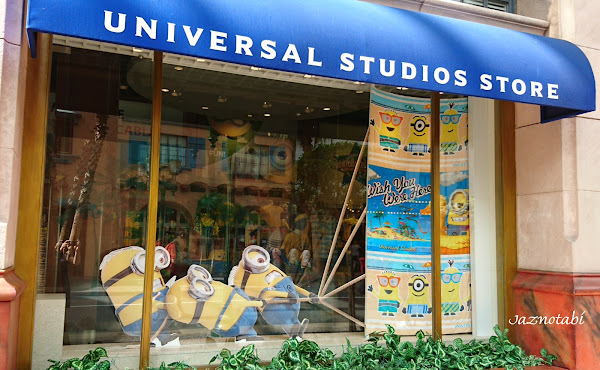 With the latest Minions Movie currently playing in our local cinemas, look who’s making appearances at Universal Studios Singapore! They do a little dance routine before the Minions meet and greet sessions are held. Plushies from the latest Minions movie caught my eye when I entered the shop! If you want something smaller, keychains are available. Bedroom Slippers – these have been around for a while. If you spend a total of $50 inclusive of any Minion item, you can buy two of these capsules for $5 and there are 24 in total to collect! For those who like a game of chance, you can buy a Blind Bag and pray that you’ll get something which you’ll like! Over at the Minion Mart, I couldn’t really find items from the latest Minions movie but these Collectable Play Figurines caught my eye! Game sets similar to those available at the Universal Studios Store, can also be found here. Here’s a close-up look at the “Trouble” game. The long wait for adrenaline junkies is finally over!! After an extensive attraction review, 27th May 2015 marked the re-opening of the Battlestar Galactica: HUMAN vs CYLON roller coasters at Universal Studios Singapore! Park guests who had heard about the coasters’ re-opening, couldn’t wait to go on the rides when they were opened to the public at 12pm! One noticeable difference is that the ride vehicles, which previously had 4 seats per row, now have only 2 seats per row, as previous feedback from park guests on the original coasters were that those seated at the middle two seats felt left out from the “action”. With this new design, all riders have a “window seat”, so as to get the maximum experience (probably a more heart-pumping one!) on the ride. The new ride vehicles now each seat 16 persons (i.e. fewer riders per ride) and thus you may wonder if the queue will take a longer time to clear – the good news is that the park does have additional ride vehicles for each of the 2 coasters, so two ride vehicles may be in operation during the peak periods for each coaster. Human coaster – the Old ride vehicle (photo on left) and the New ride vehicle (photo on right). In addition, shelves can now be found at both loading platforms and you can place your shoes and any other loose articles like hats, spectacles, etc. on the them before you board the ride vehicle. In the past, people used to leave their shoes all over the platform and it looked rather messy, plus there was the risk that your belongings could be trampled upon by klutzy folks who alighted first from the ride vehicles. Both the Human and Cylon rides are very much smoother and less bumpy than before. I remember with the previous ride vehicles, my head kept hitting the back of the seat at certain turns and the headrest then wasn’t as well-cushioned as compared to now. I have to say that it is definitely a more comfortable ride with these new vehicles!! For those who have yet to experience them, Battlestar Galactica: Human vs. Cylon is a pair of steel duelling roller coasters, which each have 1km of track and they will provide you with 90 seconds of excitement! The repetitive announcements on both rides state that they are “high-speed turbulent roller coasters that include sudden and dramatic acceleration, climbing, lifting and dropping”. Their top speed is 90km/h and the highest point on both coasters is 42.7m high (equivalent to 14 storeys). To go on both rides, you will need to be at least 125cm tall. I personally feel that nothing beats the front row if you want the best views but of course the G-forces are probably strongest in the 8th row. If the coasters are launched at the same time, you can experience the “duelling effect” as both the red and blue will cross paths at various sections of the track. I think you’ll get a better view of this on the Cylon side (well, that is if you are not too pre-occupied with screaming your lungs out to enjoy the view). Photography and videography are usually not allowed in this attraction but thanks to Universal Studios Singapore, I got the opportunity to photograph the queuing areas and loading platforms of both rides! Also referred to as the “Red” coaster, this is a seated coaster with no inversions, but it does have lots of turns and a couple of drops. I personally feel this is the milder of the two rides. The first drop used to be quite scary with the old lap restraints when the ride first opened in 2010/2011, but ever since they had replaced the restraints with the overhead ones, you can no longer experience that “free fall” feeling on that initial drop and I really miss that! With this re-opening, overhead restraints are still being used, so I personally take this coaster to be just a “scenic ride” if I want a bird’s eye view of the park (plus the ride photos taken are nicer than that on Cylon’s). Look around and you can see various interesting props on display. The most impressive display in the queue area of this ride is this Viper spacecraft and you can’t miss it when you walk by! When you reach the rows of uniforms, you’re almost at the loading platform. This is the new 2-seater ride vehicle! Here’s a look at the back of the ride vehicle. This is also known as the “Blue” coaster and is my favourite of the two. The ride has a total of 5 inversions and I tend to liken the experience of the final inversion on the ride to be similar to the feeling of being tumbled inside a washing machine. 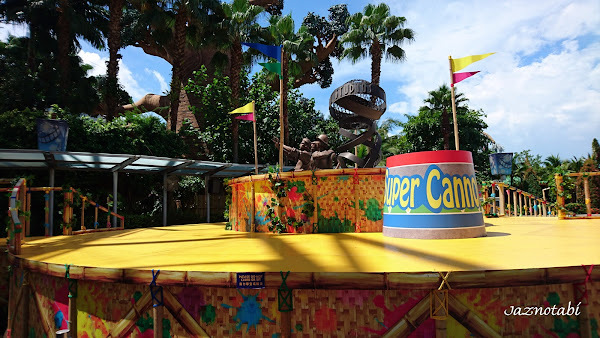 Do note that this is a suspended coaster and your legs will be dangling freely on this ride, so do leave your footwear on the shelves at the loading platform if you are afraid that they may fall off during the ride. This display with rows of Cylon robots looks impressive! Walk through this section and make your way up the stairs to get your adrenaline fix. This new 2-seater ride vehicle provides a more heart-racing experience! Although the back of this coaster doesn’t look as nice as that on Human’s, I still love this ride!! Get my latest updates on Facebook! Amazing Burgers at DELI FU CIOUS in Tokyo!